A female goldenrod crab spider preying on a fly. Photos by Mary Vasey. 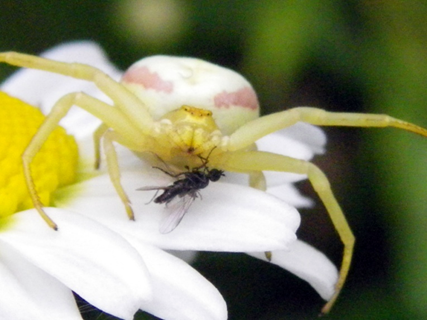 ​The goldenrod crab spider holds is legs out at its sides like a crab. The front two pairs of legs are longer than the back two. While both sexes can vary in colour — and individuals can alter their colouring for camouflage — each has a general colouring that is quite distinct from the other. The female tends to be yellow or light green to white with pale legs, a reddish streak along each side, and a reddish-brown spot between the eyes. The male has a similar abdomen (white with two central reddish bands) and a dark reddish-brown cephalothorax, marked by a white spot in the centre and another front of the eyes. The front two leg pairs are dark reddish-brown and longer than the back two yellowish pairs. 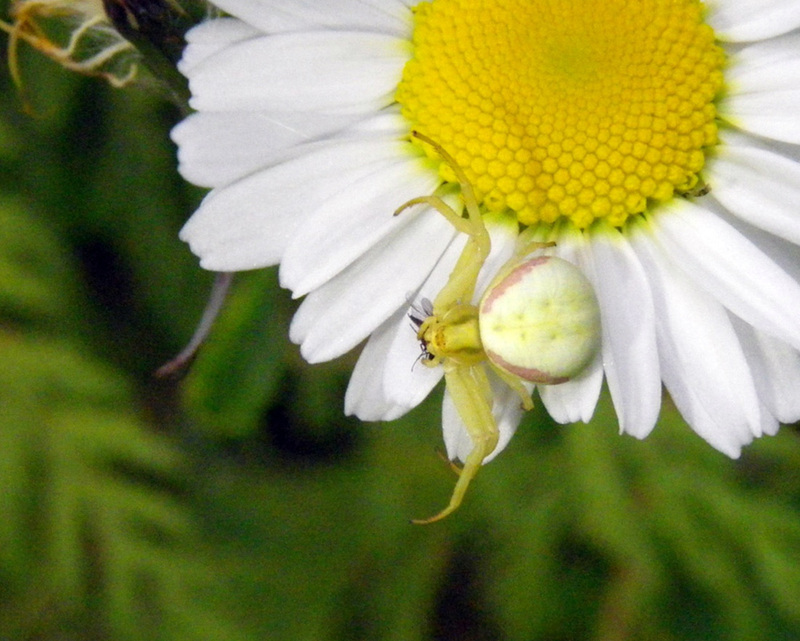 The goldenrod spider is often found camouflaged on daisies, goldenrod, other white or yellow flowers, and also leaves, in open habitats such as meadows, grasslands, fields, gardens, and wetlands. It is most commonly spotted in summer, when flower pollinators (upon which it preys) are abundant. It is a common crab spider, and its range extends across North America, Europe, and northern Asia. The smaller and less common Misumenops asperatus is light grey to brownish with pink streaks on the abdomen and pink stripes on the cephalothorax, and is covered in short stiff hairs. This spider does not weave webs to trap its prey; instead it sits on flowers and waits for pollinators to come to it, at which point it attacks. It preys on bees, flies and butterflies, even those much larger than itself. It can alter its colour to more closely match the flower upon which it waits for prey. See the E-Fauna species page for photos showing this spider in action as well as the various colours it can adopt. Flower (a.k.a. Goldenrod) Crab Spider (Misumena vatia). Woodland Park Zoo. Accessed 26/10/2015. Milne, L. and Milne, M. The Audubon Society Field Guide to North American Insects and Spiders. New York, NY: Alfred A. Knopf. Pp. 906-907.